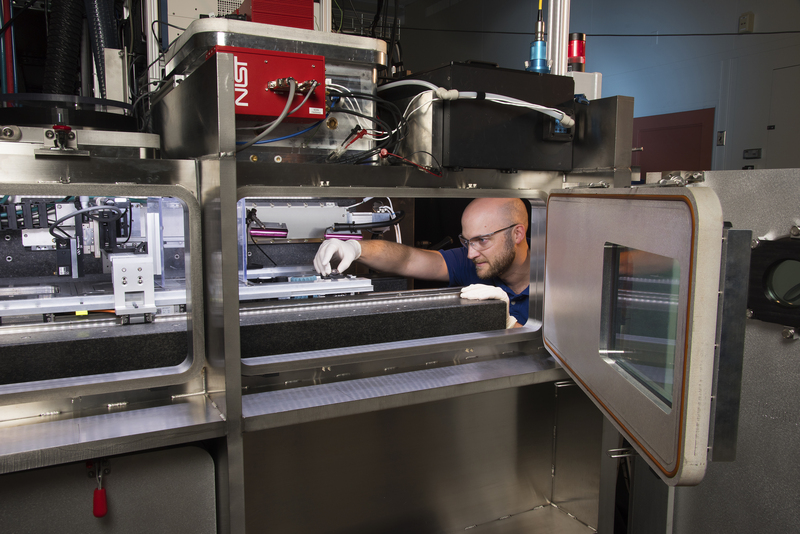 The size of a small car, the Additive Manufacturing Metrology Testbed is a custom-made 3-D metal printer that helps NIST researchers such as mechanical engineer Brandon Lane study this layer-by-layer printing process in depth to help manufacturers improve their “recipes” for quality parts and assemblies. 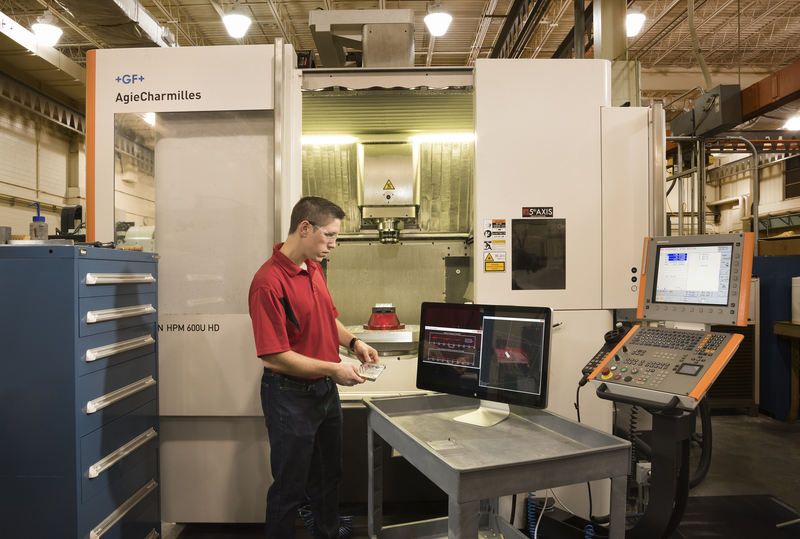 NIST has partnered with the U.S. manufacturing sector for more than a century and has a proven track record of delivering useful tools and technical assistance to existing manufacturers and aspiring start-ups need. NIST's Advanced Manufacturing and Material Measurements activities provide industry with precision measurement technologies, tests, protocols and world-class scientific and engineering knowledge through targeted research across a broad portfolio, including advanced materials development, advanced sensing, biomanufacturing and smart manufacturing systems. NIST’s efforts in advanced manufacturing and material measurements rely on three major mechanisms: partnerships with manufacturers, development of physical and information standards, and development of new measurement capabilities. NIST requests a total of $135.5 million to continue its efforts to ensure the U.S. remains a competitive force in advanced manufacturing, ensuring economic and national security. The FY 2019 request is a net decrease of $19.6 million from FY 2018 levels. The proposed program reductions reflect projects that are not yet at the critical mass necessary for full impact, or that serve more mature areas of industry. NIST mechanical engineer Tom Hedberg works with the Smart Manufacturing Systems testbed that is advancing the “digital thread,” an electronic pathway designed to seamlessly connect product design to fabrication, and cut manufacturing time by up to 75 percent. NIST develops approaches to overcoming technical barriers to the adoption of additive manufacturing (also known as 3-D printing) such as surface quality, part accuracy, fabrication speed, material properties, fracture and fatigue properties, real-time monitoring and process modeling. NIST continues to realize the vision of the Materials Genome Initiative—new materials developed in half the time and at half the cost—by developing data infrastructure and predictive modeling tools in collaboration with the NIST Advanced Materials Center of Excellence led by Northwestern University. NIST partners with the pharmaceutical industry to develop widely available reference materials and measurement methods supporting the manufacture of new classes of biological drugs. NIST supports the use of smart manufacturing systems through programs focusing on standards and performance methods for automated systems, and a digital thread test bed to evaluate the performance of in-process quality-monitoring and control systems critical to the efficient operation of modern factories.